Right in the heart of the old town where the Royal Mile meets Castlehill, you’ll find the landmark building called The Hub. Home to the Edinburgh International Festival and also a luxury venue, the Hub also has a bustling cafe. The Hub is really working at bringing in more gluten free items to its menu and you can currently choose from baked potatoes, salads, sandwiches and soups. There is a brilliant choice of breakfasts and often a GF cake choice. Service is friendly and professional and the coffee is good. This is a great place to sit and watch life go by and on good days you can sit outside. I have enjoyed a marvellous sweet potato soup with scone-like gluten free bread and, more recently, a completely delicious pesto chicken salad with GF croutons. 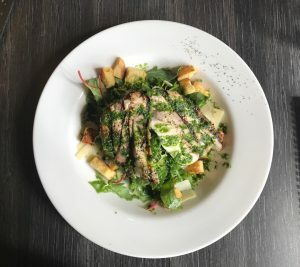 If you want a good place to stop on the Royal Mile, knowing you’ll be treated well and will have excellent GF choices, then give Cafe Hub a try. It has a licence too, so a glass of fizz with your lunch may not go amiss ….